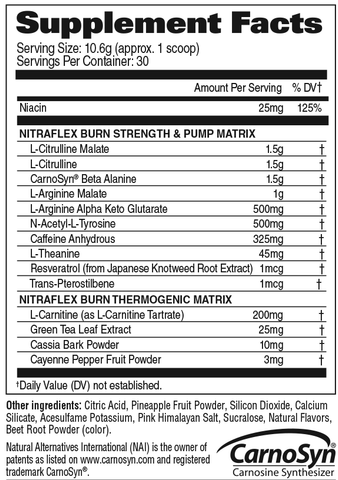 Day 1: Begin by assessing your tolerance with half a serving of NITRAFLEX® BURN mixed with 6 oz of cold water. Days 2 and beyond: Depending on tolerance, mix 1 serving (1 scoop) of NITRAFLEX® BURN with 10 oz of cold water and consume within 30 minutes before working out. 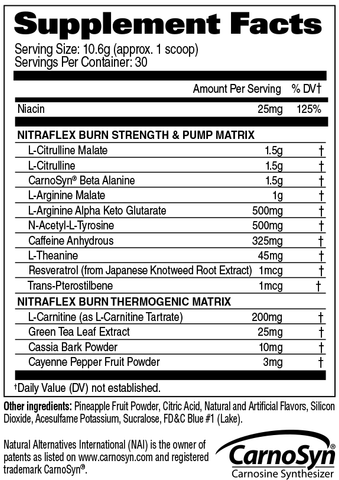 Nitraflex pre-workout delivers fast, explosive training results for a more powerful body, including energy, stamina, Nitric Oxide(NO) and testosterone optimization. Delivers 3g Citrulline for a pump. Other ingredients: Water, Natural and Artificial flavor, Potassium Sorbate, Malic Acid, Sodium Benzoate, Sucralose, Acesulfame-K. DIRECTIONS: Training days: Day 1: Begin by assessing your tolerance with half a serving of NITRAFLEX® BURN mixed with 6 oz of cold water. Days 2 and beyond: Depending on tolerance, mix 1 serving (1 scoop) of NITRAFLEX® BURN with 10 oz of cold water and consume within 30 minutes before working out. DO NOT CONSUME with any other products containing CAFFEINE with this product. Consult your health care professional before use. This product is strictly intended for use by healthy persons 18 years of age or older. Each serving contains 325 mg of caffeine. Do not use if you are pregnant, nursing or trying to become pregnant. Do not use if you are currently unaware of your health status or if you have a medical condition. Do not use if you are taking prescription or non-prescription medication of any kind. Do not use if you are prone to overheating or dehydration. Discontinue at least 2 weeks prior to surgery or if you experience rapid heartbeat, dizziness, severe headache or shortness of breath. This product contains a chemical known to the State of California to cause birth defects or other reproductive harm. KEEP OUT OF THE REACH OF CHILDREN.